2016 Camping Trip Information and Available Dates. 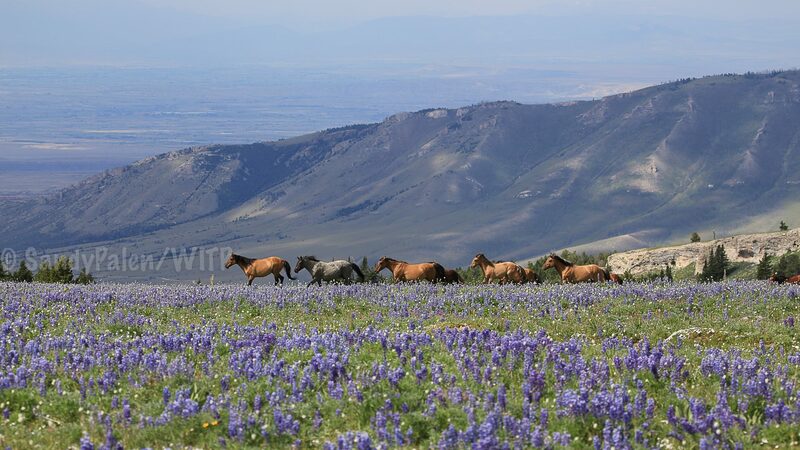 Wild in the Pryors is permitted by the Bureau of Land Management to conduct small group tours within the Pryor Mountain Wild Horse Range from January to December. Wild in the Pryors is one of a handful of businesses that have the federal permits necessary to guide clients onto this federal property. Wild In The Pryors is also licensed to give tours within the Bighorn Canyon National Recreation Area. Sandy has been coming to the Pryors Range for several years, spending weeks at a time camping with the horses. Whether you bring a professional camera, or just a cell phone to take photos, Sandy goes out of her way to make sure you leave the mountain with cherished memories of your once in a life-time camping trip. The stories she shares about the horses and the range, make this trip more than just a chance to view them, she makes this a trip more about knowing the horses, giving you a brief glance into the life of the Pryor Mountain Wild Horses. All tours may include light to moderate hiking. Guests taking in the 360 degree view and the wild horses. You will be camping at 8,500 feet, under the Big Montana Sky, with wild horses. These trips will be 4 days/3 nights on the mountain top, and also included is a two night stay at Monster Lake Ranch in Cody, Wy. (night before and night after). Also included is: transportation up and down the mountain, all food, snacks, tents, and expert personal guiding. (last night dinner is on your own once we return to Cody). Pick up at the Cody Airport can be arrange with for a small fee. Camping trips will be limited to 4-5 guests. Sandy will have an assistant with her who will do the camp cooking and help you with any camping needs. Sandy will personally be doing all of the guiding. This trip may be a bit colder than the others, but to be some of the first people to see the horses reach the mountain top for the summer, makes it all worth it. This month is the most popular and also the prime wildflower season. Maybe a chance to catch a rainbow. View of the Bighorn Canyon from the mountain top. All trips leave from Cody, Wyoming (unless other arrangements are made). Airports nearby: Billings, Montana. Cody, Wyoming. Arrangements can be made for pick-up at the Cody Airport. A 50% down payment is required upon booking with the remainder due one month prior to your trip. All payments are considered non-refundable. Refunds may be made when cancellations can be filled. Anyone interested in a trip will be asked to complete a Pre-Screening Health Questionnaire, and those who book a trip will be required to sign an Acknowledgement of Responsiblity and Assumption of Risk document, as per Montana State Law. Be sure if you book a trip with someone, that they have the proper permits in place. This is required by law for anyone giving tours on Public Lands. Please click on PERMITS to read my blog post about this. The absolute best adventure I have ever had in my life. We loved every minute of it and I will have the memories of the beauty in my head forever! Thank you Sandy, Wild In The Pryors is the Best of its kind, hands down! If you find yourself in Montana near the Pryor Mountains and you want to see these horses, go with Sandy Palen. I cannot say enough good things about her. She knows the range like the back of her hand and she is a walking encyclopedia when it comes to this herd. Because she spends so much time on the range, she knows all of the approximately 170 horses by name and can recognize them by sight. From what I understand, she has been visiting the Pryors since 2009 but to me it feels like she has known these horses her whole life. She understands the dynamics and connections between these horses so well. She doesn’t mind repeating for the millionth time which horses you are looking at or explaining how they are related. She knows how to approach the horses and will make sure you are at a safe distance, respecting the horses’ need for space. And even when all the horses seem to have vanished into thin air, she knows where they like to hide and is really good at spotting them. Amelie L., New York, NY. Logo designed by Amber Bushnell. Wild in the Pryors and this logo is copyrighted.